Calling all Fedora users and developers. Please visit the official poll to choose the future of Fedora release names. Nobody refers to “Running Fedora Verne” and choosing the name every few months is just a giant waste of time and waste of a very busy legal team that has to review and research each stupid name. I think “Beefy Miracle” is a ridiculous name that really takes the edge off an otherwise most professional release. Just have the next release name as Fedora 18 and be done with the nonsense names once and for all. Release Names are Fun, and they inspire the Artwork that is used for that release. My brother really loved the Verne wallpaper and is looking forward to the Fireworks one. Wallpapers aside, A project that takes itself too seriously is boring. And boring projects don’t attract new users / developers. Finally, niost distros have funny names, look at Debian’s Toy Story names, or Ubuntu’s Qrazy Quetzal. I do agree that perhaps Fedora took it to a place noone else has, with Ketchy Ketchup being one of the accepted proposals… but I don’t think dropping the release name altogether is the ‘best’ path Fedora can take. I agree with “Release Names are Fun, and they inspire the Artwork that is used for that release.”. This is good reason for having project names – like your brother, I thought the default Verne imagery was great, the underwater scene and submarine. Unfortunately, neither “Beefy Miracle” nor any of the proposed F18 names serve this purpose. I also would like to comment that I really think these elements that are fun and creative also show the culture and community involvement. I really liked calling F17 the “Beefy Miracle” because not only was it such a community based meme but it was also to showed that the community really has a driving force in this project. Furthermore, I don’t think it’s a “ridiculous name” because as far as I’m concerned, it doesn’t just refer to a hot dog or a stupid meme. Alas, I will admit I’m very disappointed with the name choices this year; I would have hoped that the names would less silly. I fear F18 may have a name that’s less than satisfactory, but I would stress I do not think F17’s name is a problem. I dislike polls because they are so binary. While I agree that perhaps our naming has gotten a bit out of hand I can’t help but feel this is a “get off my yard you crazy kids!” kind of reaction. Taking the fun and inside jokes out of Fedora to make it more “serious” is sort of pulling it in the extreme other direction. Beefy miracle does have a history within the Red Hat distros and while the joke may be lost to the outside world it does carry with it some value. Why is it we can’t find a balance to allow Fedora to still be fun while also letting its features stand as a serious OS? I should also note the reason people don’t call Fedora releases by their name is the criteria for linkage between the names is somewhat over intellectualized so it is hard to remember (though I think beefy miracle will be remembered with perhaps a laugh or a lampoon). Apple has cats, Ubuntu has rhyming animals, o’rielly has exotic animals, etc. The animals are perhaps coincidence but the simple linkage from release to release does make it easier to use the code names. Numbers quickly get unwieldy and impersonal, especially with 6-8 month release cycles. In some ways I agree and in others I don’t. I’m not a fan of the “beefy” name of Fedora 17… and looking over the choices for Fedora 18… they are mostly food related and I’m not a fan of the choices.! I’ve loved the “codenames” pre-17, like Verne and if they were like that, i’d say keep them. But as to the current tend (and the apparent work of approval), maybe it’s better to retire them. So I’d guess I’d vote on changing the process of naming the releases. I thought the release name for Fedora 17 was a joke then i read about its bond with RedHat history. Ok, the first and the last time, stop. I like to choose/propose a release name but stop with “frankfurter, etc..”. I totally agree – “no release name” would indeed be a welcome “feature” for Fedora 18. RHEL already covers the “pro” corner of the market. Fedora is the fun, fresh, edgy distro at Redhat. The only problem I have with Fedora release names is that they are not incorporated into the marketing material enough. Wallpapers and boot screens should clearly match the release name, but seem to rarely do. Fireworks == Beefy Miracle? Maybe the inside joke has gone too far because I don’t get the connection. Someone has beef with the miracle that is F17? +1, stop the nonsensical release names! I also voted for dropping them. Lawyers have to review the release names? Sad… Any idea how much work it is? E.g. would the money spend on this task be able to cover the salary of a part-time developer? J5: I don’t think it’s possible for _any_ set of codenames to be easier to remember, particularly in sequence order, than the corresponding set of integer numbers. Fedora’s release numbering scheme is sufficiently simple and consistent – it’s just the integers counting up from 1, always has been, and hopefully always will be – that I don’t think we could ever come up with a codename scheme that anyone would prefer. As Richard says, almost no-one actually refers to the Fedora releases by codename. I can’t remember ever hearing/reading a post like “I’m running Fedora Verne and I need some help with…” It just doesn’t happen. You missed my whole point of when used right code names are more memorable than release numbers, especially if the press picks them up. They can give personality to the distribution. When people talk about android they talk about Ice Cream Sandwich, Honeycomb or Gingerbread, not 4.0, 3.2 or 2.3. Apple build similar buzz by attaching feature expectations to such releases as Snow Leopard and Lion. The issue isn’t naming, the issue is we have diluted the relationships of the names by having a convoluted criteria which in the end produces names that really don’t speak to the personality of distro unless you understand criteria. Android is sweet; MacOS is fierce; Fedora is an over intellectualized child who enjoys specious riddles? Luckily ‘Fun’ is not part of the four foundations. Otherwhise we would have to remove it now. Beefy Miracle is a bit of an exception, but the thing with that is that the Beefy Miracle gag had existed for a long time beforehand. It was already funny. We had lots of fun referring to it. I’m not sure anyone actually had a whole lot _more_ fun by making it the codename of a release. It’s not like we went all out and used the mustard graphic for the Plymouth theme or something, we didn’t even incorporate it in the background in any obvious way. It’s just a silly name and nothing but a silly name, unless you already knew about the in-joke. Maybe the mircale is that no-one eats beef (or other kinds of meat) anymore. “Beefy Miracle” is not only a lousy codename, it also features a terrible, terrible artwork. Software is a fine art, and you can choose great, witty release names without sounding like an actual greasy, cheap hot-dog. 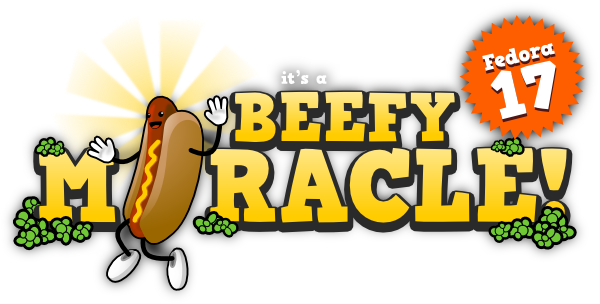 I agree that “Beefy Miracle” comes under the category of “f*cking stupid” release names – it might be a Fedora in-joke, but most of the people who encounter the name certainly don’t get the joke, nor think particularly highly of whomever thinks this kind of thing is funny. Release names are pointless, they aren’t endearing when they’re so random anyway (and only last 6 months), they aren’t carried through in the artwork, and not memorable. Numbers make more sense, and the names smack of competing with that other distribution out there with silly animal names. this hope to spare time with names is turning into a giant poll. Maybe could we give this post a name? Come on, GNOME has a long track record of giving releases schizophasia-flavored names. Comparing to that “beefy miracle” is relatively healthy. And that sausage inna bun won’t last long anyway. I mean, look: it already got mustard all over itself. Ah, Simon – you must not be aware of the Genghis Khan (Temujin) release – GNOME 2.4.0 – and the resulting flame-war. That was the release that caused GNOME to abandon release names. GNOME as a project has apps. That’s what I was referring to. Sincerely I hate those incremental numbers. Firefox, I don’t know which version number I have. Fedora the same, sometimes I’m still thinking to use F17 ! I’d like to see from the name how old a distribution is. So why not a very simple scheme such as 2012.1 and 2012.2 ? Sincerely I’d like that scheme for the linux kernel. I don’t like ubuntu’s scheme either because the month is fixed in the name. My first Linux was “SuSE Linux November 1995”. Good old days! Release names must be carefully chosen. Hindus and others revere the cow, ergo beef, and they would find the hotdog and beef obscene. For Fedora 18, you could use Fedora Chai. Chai is 18 in Hebrew, it also means luck, good life, and it also means wishing nice things to people. But, then it is not a food. Who says that the link should be a food. If it is a food, I could live with Fedora Olive. (Have to google results to assure no name conflicts). Chai Tea doesn’t count as food? My big surprise was that Beefy Miracle was eligible, as I fail to see a connection between it and Verne and I thought a connection, even fairly tangential, was required. I’m also surprised it got past the vegetarians and Hindus, and I’m also also surprised that it wasn’t rejected out of hand for sounding ridiculously unprofessional. I know Ubuntu’s release names are getting increasingly implausible, but that’s no reason to get silly. The connection was “both have been proposed as names for F16” which si pretty lame …. What would really win is to drop the sequential number, and use a year / month or year / week of year. Once you get a release number about 10, it just seems stale. (I am making up the months here, just so you get the idea of how they would fit). I know I am not involved in the Fedora project, but my take on this is that you can have the best of both worlds. People seem to enjoy the release names, but it seems to me that the problem is that there is too much time wasted on picking the names. Why not just simplify how the name is picked and pick something, and then this way you get a name that people enjoy without it feeling like it is a timesink. From my point of view those nicknames are very useful. It’s much easier to search for “foo bar ubuntu oneiric” than to seach for “foo bar ubuntu 11.10”, the results way better.